Soups are a great meal for anytime of the year. Hearty, warming soups for the colder seasons and lighter consommé or cool gazpacho for summer months are nourishing and tasty. January is a month often marked by colds, coughs and generally feeling run down. The combination of late nights, over indulgent foods and excess alcohol depletes us of nutrients, taxes our systems and results in a sluggish tired body in need of rest and recuperation. We moved our little boy from his cot into a bed at the beginning of December and his excitement of having this newfound freedom has led to a much later settling time for bed and very interrupted sleep for weeks. As a result of having 6 weeks of running on minimal sleep I became unwell with a tummy bug and totally lethargic for 48hrs. The following soup helped restore my energy. 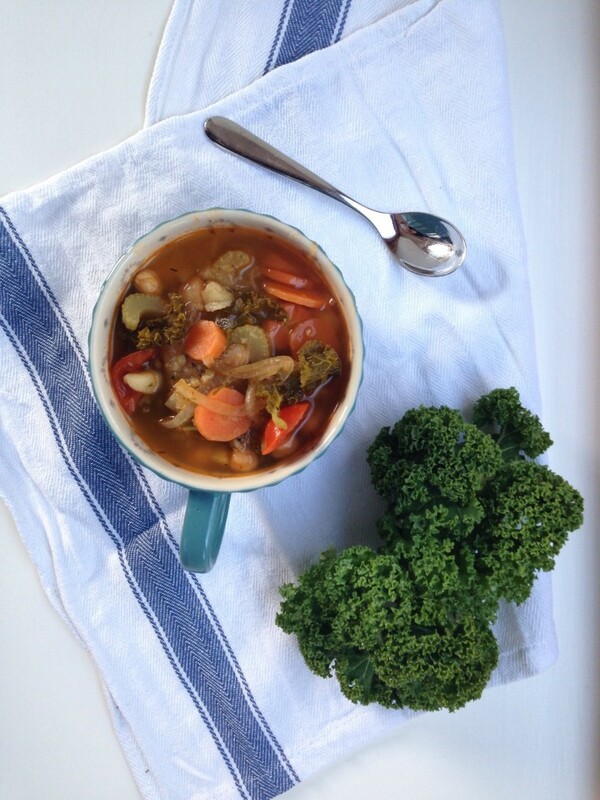 A bowl of veggie soup is most welcomed when you’re feeling low. This is one of my takes on a vegetable soup but of course there are so many combinations of vegetables to choose from that rarely any two vegetables soups are the same. I love the kale in this recipe as I feel it gives an injection of health. I’ve also added quite a lot of garlic which I really like ( my husband does not!!) but it’s a great boost for the immune system. Place the coconut oil in the pot and add the onion, carrots and celery. Allow to sweat for 10 minutes or until they start to soften. Next add the potatoes, tomatoes, herbs, kale, pepper, and tomatoe purée. Stir all the vegetables together. Add the vegetable stock. Bring to almost a boil then reduce to a simmer. Put the lid on and allow to cook for 15 minutes. Take the lid off and add the chick peas. Leave the soup simmering and reducing slightly for about 20 – 25 minutes until all the vegetables are soft. Add the garlic just before you serve and enjoy. Garlic has numerous health giving properties and is great for helping fight off bugs. It’s an anti-viral, anti-fungal and antibiotic. The active ingredient in garlic is allicin. This compound starts to be activated once crushed. It’s best to crush your garlic cloves and leave them aside allowing this compound to build and only add to your food at the end of cooking to retain these health giving properties. Allicin changes once cooked. I’m just back from the shops with ingredients for a veggie soup. Really wish I’d seen this post before I did my shopping!! Can’t wait to make this one during the week, will let you know how it goes. The perfect post-Christmas restorer! But isn’t Jake descended from a ? I think he is one of the long lost uonwnkn dogs. Perhaps that beetroot in the pic is the spirit of his great-great-great-yaddah-yaddah-yaddah-great to the power of 12 granny.